Small cognac stills are superb pieces of equipment, and Crispin Cain is a master at extracting soft, clean, rich, pure, and wondrously flavorful. The review in Malt Advocate that awarded “Artisan Distiller of the year” said, essentially, “we can’t believe we are awarding this to a clear whiskey”. These whiskies are amazingly soft and rich, with beautiful finishes. Clear Wheat – $45. From malted Bavarian hard wheat on the Germain-Robin 16HL antique cognac still. Wort is slow-fermented to 8.8%. Not hooch: sophisticated, soft, tasty, and long. Whiskey Advocate’s “Artisan Whiskey of the Year”. Sold out. Clear Rye – $45. Malted rye. Full rye body. The roughness of most ryes is here tamed by the small cognac potstill. Fabulous. Bottled November 2013. Paul Pacult: “if not the finest white whiskey I’ve ever tasted, damn near the best”. 44.1% abv. Straight Bourbon – $70. Crispin Cain started distill whiskey for sale in 2010, but he waited for three years before making a bourbon because he wanted to feel completely confident in the process. The mash bill is corn, barley, and rye; aged in selected new bourbon barrels. A number of devotees have told us this is the best bourbon they have experienced. Crispin’s take is here. Barreled Rye – $70. Very smooth, very rich. Full rye body. 100% rye malt extract. Fabulous. Aged 2 + years in new and used bourbon, used cognac barrels and new small cooperage barrels from Minnesota. 42.2% abv. Barreled Wheat – $75. Bottled at 2+ years, this amazing whiskey shows what can be accomplished by a master working on a cognac still. Smooth, rich, surreal. 43.1% abv Sold Out. Four Year Barreled Wheat – $75. A blend of 4 and 5 year old whiskies from 2010 and 2011. 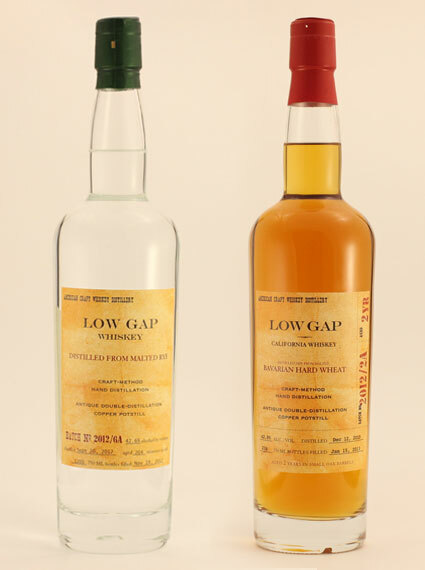 These were some of the first whiskies Low Gap produced. The flavor is dense and complex. 45.5% abv. Blended Whiskey – $75. Malted corn and barley. Aged in used Van Winkle barrels and new Missouri oak bourbon barrels. Amazingly mellow. soon. 46% abv. 100 Proof Barreled Wheat – $75. From malted Bavarian hard wheat on the Germain-Robin 16HL antique cognac still. Aged 2+ years in a special selection of three new and used American oak barrels. 50% abv. Single-barrel no.2 – $75. Mostly malted Bavarian wheat. This bottling was aged in a 200-liter new white oak (Minnesota) barrel of exceptional quality and descended to bottling proof with filtered rainwater. 50.2% abv Sold out.